Highly important pair of George III style mahogany trellis back armchairs having acanthus leaf carved crestings above pierced 'Chinese' fretwork backs with conforming trellis filled arms, the seats upholstered and on pierced fretwork square front legs headed by conforming angle brackets with leafy 'C'-scrolls, the rear supports of round form and slightly splayed. These chairs relate to a design for a 'Chinese Chair' published by Thomas Chippendale, The Gentleman and Cabinet Makers Director, Third edition, 1762, plate XXVIII. Available for the first time in over 80 years, the present chairs are identical in design, construction, and age to armchairs supplied to William Lever, 1st Viscount Leverhulme, at Thornton Manor by 1898 as part of a suite of seat furniture comprising one settee, supposedly eight armchairs, and four side chairs. These chairs are almost certainly an undocumented addition to the documented eight armchairs, four of which are in the Lady Lever Art Gallery in Port Sunlight Village, Wirral, England, UK. Provenance available upon request. Excellent. Wear commensurate with age and use. Reupholstery recommended. 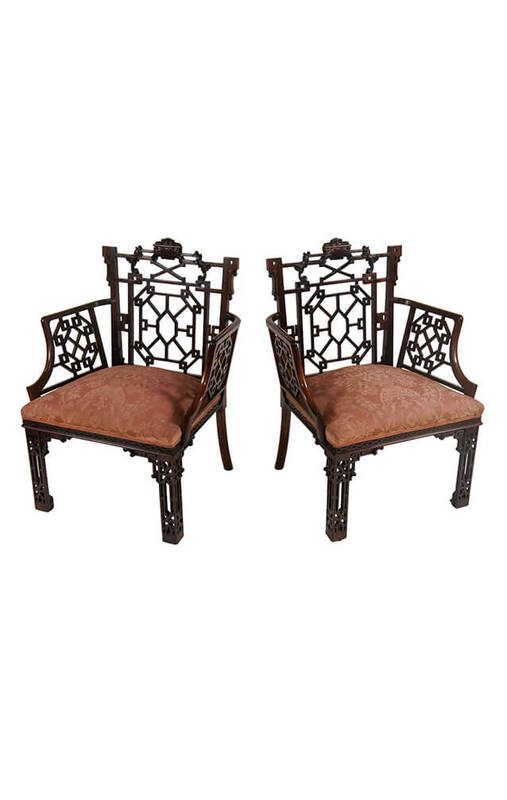 Highly important pair of George III style mahogany trellis back armchairs having acanthus leaf carved crestings above pierced ‘Chinese’ fretwork backs with conforming trellis filled arms, the seats upholstered and on pierced fretwork square front legs headed by conforming angle brackets with leafy ‘C’-scrolls, the rear supports of round form and slightly splayed. These chairs relate to a design for a ‘Chinese Chair’ published by Thomas Chippendale, The Gentleman and Cabinet Makers Director, Third edition, 1762, plate XXVIII. Available for the first time in over 80 years, the present chairs are identical in design, construction, and age to armchairs supplied to William Lever, 1st Viscount Leverhulme, at Thornton Manor by 1898 as part of a suite of seat furniture comprising one settee, supposedly eight armchairs, and four side chairs. These chairs are almost certainly an undocumented addition to the documented eight armchairs, four of which are in the Lady Lever Art Gallery in Port Sunlight Village, Wirral, England, UK. Provenance available upon request. Condition: Excellent. Wear commensurate with age and use. Reupholstery recommended.